If you happen to be in southeast Michigan on September 25 or 26, head to Kensington Metropark! Kensington Astronomy at the Beach is the biggest astronomy event in the area, and a very unique one. Amateurs and professionals alike work together to put on this event that includes everything from guided sky tours to big ‘scopes you can look through. Talks, planetarium shows, demonstrations and activities go on no matter what the weather is like. Visit GLAAC.org for more information. September marks another lull in significant meteor shower activity. However, minor showers and the ambient meteor level are slightly higher at this time of year, so if you happen to be out late, or early, it’s worth watching for a few. As usual, it is much better to look for meteors under dark skies than the normal urban skies. Check out the weekly update form the american meteor society for week-by-week predictions. The autumnal equinox occurs on September 23 at 8:22 UTC , which is 4:22 AM in Michigan. A well timed total lunar eclipse occurs on September 27, starting just after sunset in Michigan. Maximum eclipse occurs in Ann Arbor and 10:47 PM, when the Moon will be high in the southeast. For timing details and more information, or information on another location, see http://www.timeanddate.com/eclipse/in/usa/ann-arbor. Of course if there’s a lunar eclipse there must be a solar eclipse too. In this case, it’s a partial eclipse visible from parts of Africa and the Indian Ocean. Full: September 27. This is the closest full moon if the year. Observers in the northeast may have the chance to see the Moon occult Aldebaran on September 5th. Unfortunately in southeast Michigan, it ends just before moonrise. Mercury is at greatest eastern elongation on the 4th, so it’s visible in the evening at the start of the month, but look for it soon. The ecliptic is low to the horizon at sunset for northern hemisphere observers at this time of year, so it gets really hard really fast to spot. On the other hand,southern hemisphere observers get their best chance all year! It’ll be in conjunction on the 30th, so no one will really get to see it by the last week of the month. Venus is the gem of the morning skies. Just passed conjunction at the start of the month, it’s so bright it’s easily mistaken for plane or other terrestrial object. A pair of binoculars should be all you need to pick out it’s crescent shape. It’s headed for maximum westward elongation at the end of October so you’ll have plenty of time to spot it. It lines up with the Moon and Mars between Regulus and Procyon on September 9. Use binoculars or a small ‘scope to pull the objects out of the morning twilight. Looking east before dawn on Sept 9. In a mythically appropriate pairing, Mars is near Venus all month. Unfortunately it’s not nearly as bright as Venus so it’ll be tough to spot in the morning twilight. 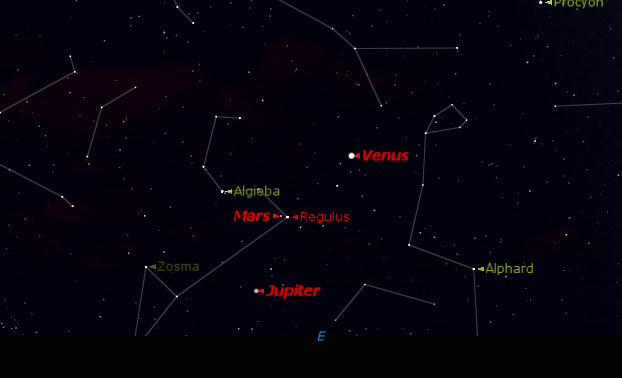 Also look for Mars and Regulus to make a close pair on September 25. Jupiter is just past conjunction at the start of the month. Look for it in the morning twilight after the first week. Saturn is well up at sunset now, the only naked eye planet in the evening skies. The ring tilt is big enough to be visible with just a pair of binoculars. A small ‘scope should enable you to pull out the Cassini division. It makes a nice pair with red Antares all month, but be sure to look on the 18th & 19th when the moon joins the pair. 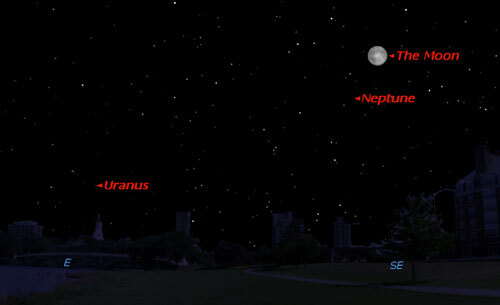 Rising around 9:30 at the start of the month, Uranus is not a bad target no matter what time of night you observe. It pairs with the moon on the 1st and again on the 28th. Neptune opposition is September 1, which actually makes this the best month this year to spot this distant blue planet. It’s a bit tough though. There aren’t many landmarks to guide you. The Moon will help on September 25. 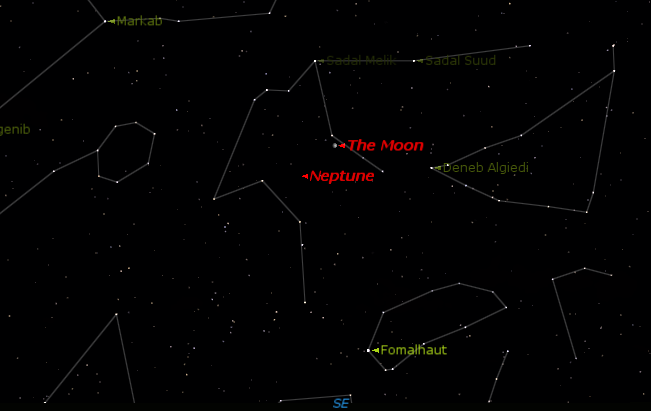 The Moon can help you find Neptune on 9/25. October makes up for a couple fairly quiet months with several events. October gets off to a great start with a lunar eclipse on the 8th. You can read my earlier post about it, or check out http://www.timeanddate.com/eclipse/lunar/2014-october-8 to get details about observing it where you are. If it isn’t visible or the weather is bad, check out one of the many live feeds from the Griffith Observatory, Slooh.com, or Stargazers. 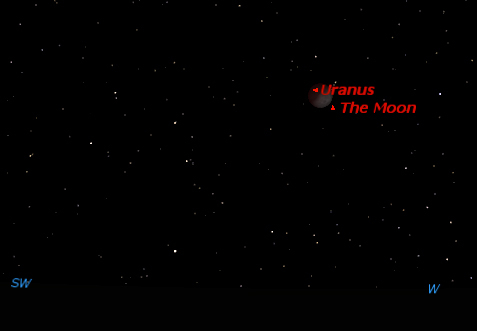 Uranus is just off the limb of the partially eclipsed Moon ot 5:45 AM on October 8. Whenever there’s a lunar eclipse, there should be a Solar eclipse two weeks latter. Most of the US will get at least a piece of this partial eclipse on October 23. I’ll post more about that in a couple weeks. To check if you’ll be able to see it and how much of the Moon will be obscured, check out http://eclipse.gsfc.nasa.gov/SEsearch/SEsearchmap.php?Ecl=20141023 or http://www.timeanddate.com/eclipse/solar/2014-october-23. The Draconids run roughly Oct 6 – 10, and peak on the morning of the 9th. The nice thing about this shower is this is circumpolar for anyone in the US or Canada. The bad thing is the peak rate is only about two meters per hour, they tend to be faint, and it’s the day after the full moon, so it’s only really worth watching for the diehard meteor fans. The Orionids on the other hand are much more worth watching. They run October 1 through November 14 but peak on the evening/morning of October 21 – 22nd. In a typical year the peak is 20 to 25 fast-moving meters per hour. Exceptional years can produce 50 to 70 meteors per hour. Check the American Meteor Society homepage, http://www.amsmeteors.org/ a few days before to find out if this is expected to be an exceptional year. Orion rises at 11:15 on the 21st, and transits at about 5 AM on the 22nd. With sunrise just before 8 AM, the best time to watch for these meteors will be about 4 – 6 AM. The radiant of the Orionid shower is just above the constellation. The map is for 5 AM on Oct 22. 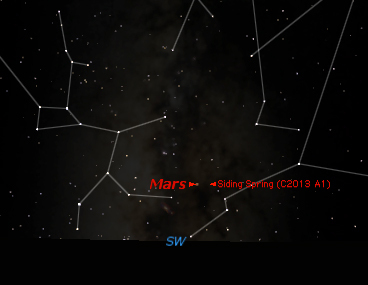 On October 19, comet Siding Spring has a close encounter with the planet Mars. It will pass a mere 132,000 km away from the planet, which is close enough for their atmospheres to interact. What better time for two new space probes to arrive at Mars! In fact, the Mars exploration teams at NASA are so excited they dedicated a page just to comet Siding Spring: http://mars.nasa.gov/comets/sidingspring/. Expected to be around magnitude 10, you’ll need a telescope to spot the comet. Mars and comet Siding Spring low in the southwest at 9 PM on October 20. Mercury is sinking fast in the west as the month begins. Look for it in the morning skies beginning around Oct 21. Greatest westward elongation is actually on Nov 1, so the last few days of the month should be a great time for morning observers to catch this elusive planet. Mercury before dawn on Oct 25. Venus and the Sun are aligned just below the horizon. Already lost in the Sun’s glare at the start of the month, Venus is headed for superior conjunction on Oct 25. It’ll appear in the evening skies around early December, and those long winter nights should make for spectacular Venus observing. Mars is getting farther away from us as it approaches the Sun this month. Matched with it’s rival Antares, and not far from Saturn, it makes a beautiful naked eye observing opportunity at the beginning of the month. It slowly drifts away from Saturn as the month progresses. On Oct 27 & 28 a fat crescent Moon passes it. The Moon and Mars at 8 PM on Oct 27. Jupiter is the gem of the morning skies this month. A fat waning crescent Moon passes it on Oct 17 and 18th. 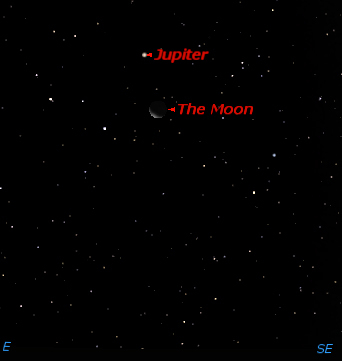 The Moon passes near Jupiter on the mornings of Oct 18 & 19. Chart for 6 AM on Oct 18. Saturn disappears slowly into the sunset this month. 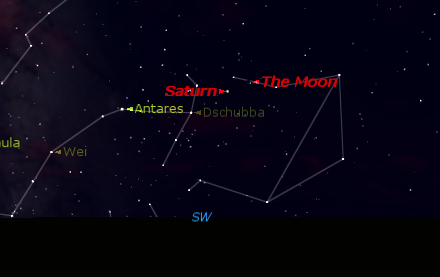 Look for a very young Moon in conjunction with Saturn on Oct 25. Neptune hangs out in Aquarius this month. It’s actually quite close to the 4th magnitude star Sigma Aquarii. Looking SSE at 10 PM on Oct 17. 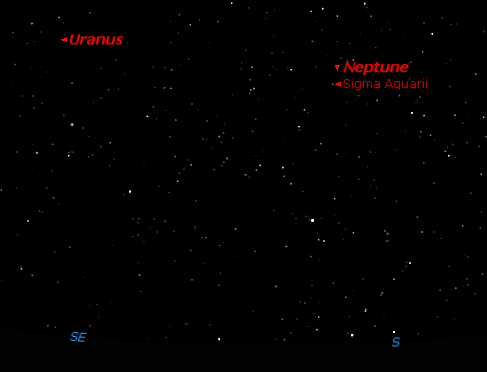 Neptune is just above Sigma Aquarii in the south. Uranus is in the southeast. Uranus is at opposition at the start of the month, so it’s a great time to observe this distant world. Catch it on the morning of October 8 when it sits just off the limb of the eclipsed Moon! In late September, ISON remained a dim, 12th magnitude object, so it’s probably not going to be a good urban skies object. It’s in Leo this month, which is low in the east at 6 AM at the start of the month, and somewhat higher in the ESE at 6AM on Halloween. 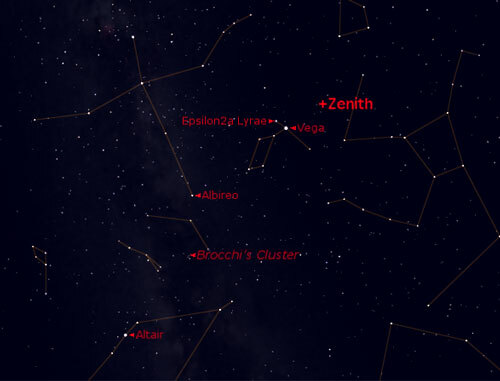 Star charts are available at http://www.aerith.net/comet/catalog/2012S1/2012S1.html. If you want to generate your own charts or have a go-to ‘scope, you can get the ephemeris from http://scully.cfa.harvard.edu/cgi-bin/returnprepeph.cgi?d=c&o=CK12S010. Early risers who do astrophotography may want to check out the ISON campaign at http://isoncampaign.org/. You can get the latest predictions and news on observing from there, or share your images to help scientists gain a better understanding of comets. The Orionids occur this year on October 21 – 22. The best time to observe is 3 – 5 AM, when Orion in high and the sky overhead is facing into the oncoming stream of meteors. This is not the best shower for those new to observing: expect 15 – 25 meteors per hour, mostly swift and faint. You’ll want a dark sky with a clear view from east to south to catch the most meteors. Now on to things that actually ARE good for urban observers! Mercury is at its best early this month. Greatest eastern elongation occurs on Oct. 9, which is the farthest it gets from the Sun, so it’s the best evening views. Unfortunately, the ecliptic is close the the horizon at sunset this time of year, so look for it to be low in the WSW about 15 minutes after sunset. Use binoculars on Oct. 6 to spot it along with a young Moon and Saturn 5º – 10º above the WSW horizon, and about 20º from bright Venus. Image made using Starry Night. Venus plays evening star this month. It hangs out low in the southwest, easily visible for more than an hour after sunset all month. Look for a nice conjunction with a young Moon and the stars of Scorpius on Oct 8. It passes close by the red giant Antares Oct 15 – 17. Greatest eastern elongation occurs on October 30, so the end of this month and early November will the best time to observe. Mars is still a morning planet. Look for it somewhat high in the east an hour before sunrise all month. An old moon passes close by on Oct 1, and again Oct 29. There’s a conjunction with Regulus on Oct 14. Jupiter is also out in the morning for October, although it rises just before midnight at the end of the month (actually, at 10:56 on Oct 31!) Look for a nice third quarter Moon to pass it by on Oct 25 – 26. 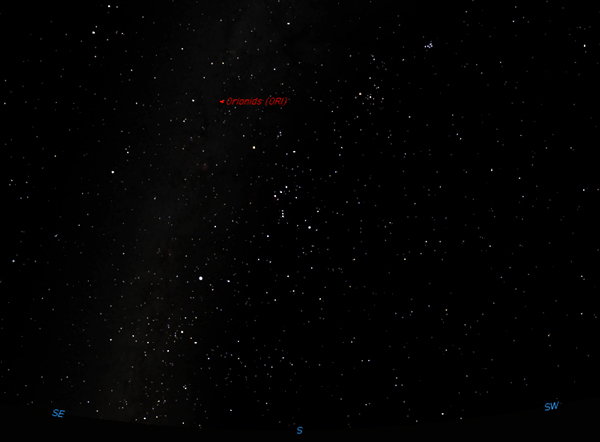 It is working its way slowly through Gemini right now, so look for it high in the ESE an hour before sunrise. Saturn is a hard catch in the evening twilight. You’ll need binoculars to pick it out of the glow, and by the end of the month it might not be worth the effort. Look for the crescent Moon very close to it on the 7th, which is almost as good as the grouping on the 6th. Mercury and Saturn are at their closest on the 8th. 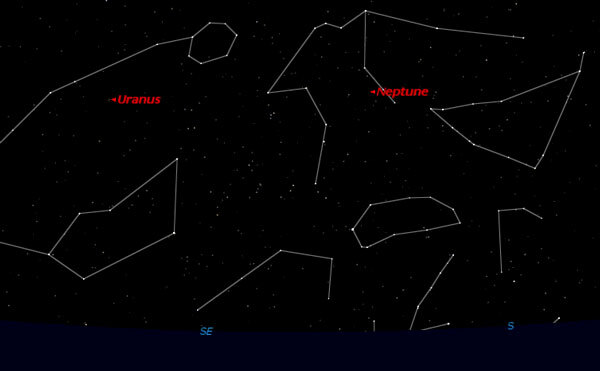 Uranus and Neptune are both good targets if you have a ‘scope and can find them. Look for Uranus in Pisces about 20º up in the ESE at 9 PM on the first of the month, and almost 40º above SE at 9 PM on the 31st. Neptune is in Aquarius, 30º above SE on the 1st, and 35º above south on the 31, both at 9 PM again. Neptune shares the field with a couple other stars of 7th magnitude, so a good finder chart will be very useful. 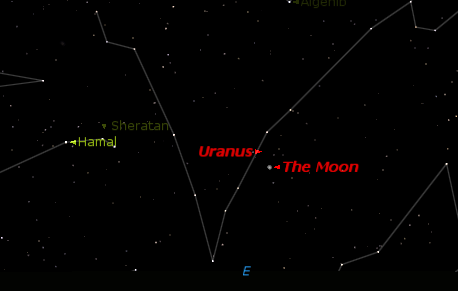 Uranus is at opposition on Oct. 3, so it’s also at its brightest right now. At magnitude 5.7, it should be unmistakable if you get your ‘scope pointed at it. The next brightest thing within 5º is a background star of magnitude 6.9! October 19, 9 PM EDT, looking southeast. Image made using Starry Night. The full Moon occurs at 23:38 UT (7:38 PM EDT) on Oct 18. Technically, there’s an eclipse at that time (running from 5:51 – 9:50 PM EDT, with deepest eclipse at 7:50 PM.) However, it’s a penumbral eclipse, so unless you’re a really careful observer, or have a photometer to measure the light reflected from the Moon, you won’t notice a thing. If you want to know more, check out Fred Espenak’s page on it: http://eclipse.gsfc.nasa.gov/OH/OH2013.html#LE2013Oct18N. As August opens, be sure to look for the Delta Aquarid meteor shower. While the peak was July 29 or 30, this shower doesn’t have a well-defined peak, and generally continues to be active for another week or two. In fact, Perseid observers often report seeing a few Delta Aquarids. Speaking of the Perseids, they should peak this year on August 12, give or take a day. The best time to look for them should be around 3 – 5 AM between the 10th and 14h. The Moon will be first quarter then, so the early morning skies will be nice and dark. If you find a dark site, you should see 50-100 meteors per hour, or about a meteor a minute. It’s still worth watching in urban skies too, though. The Perseids have a high number of fireballs, which are visible even in some of the worst skies. There may be only a half dozen of these in an hour, but trust me, seeing only one is worth it! Evening observers should look for Venus low in the west in the first hour after sunset all month. Early in the month it should be almost due west, then moving towards the southwest as the month progresses. 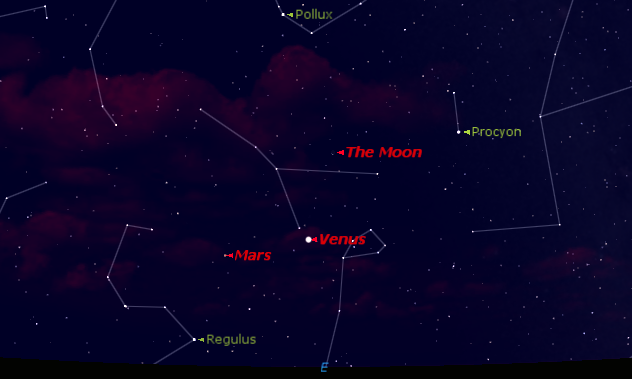 Look for a three-day old Moon to pass Venus on the evening of August 9. Saturn starts the month high in the southeast at sunset. Look for it low in the east-southeast at the month’s end, just after sunset. A wide crescent Moon passes Saturn between the 12th and 13th. If you have a telescope and enjoy a challenge, be sure to look for Neptune at the end of the month. It’s in Aquarius all month. The full Moon passes a mere 7° above it on the evening of August 20. At magnitude 7.8, you’ll need a star map or a go-to ‘scope to find it. It will be at opposition on the 26th, so September should actually be the best month this year to observe it. As long as you have the telescope out, you might as well look for Uranus. It doesn’t rise until around 11 this month, but if you have dark skies it’s actually a naked eye object. It’s a magnitude 5.8, and rises almost due east all month. 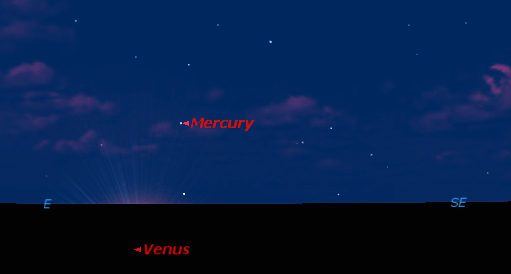 Early risers get a shot at Mercury as the month begins. 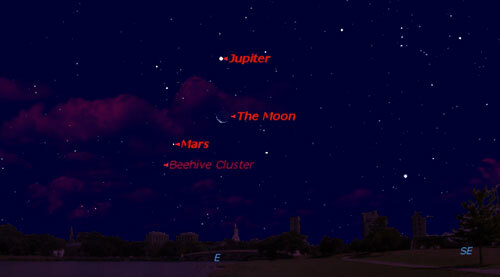 You can also get a look at Mars and Jupiter all month. 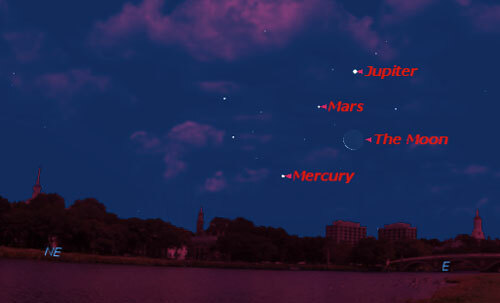 Mercury, Mars, Jupiter, and a waning crescent Moon line up together in the east-northeast on the mornings of August 2 – 4, though on the 4th, you’ll need binoculars for the Moon. Mars, Jupiter and the Moon make another nice group along with Castor & Pollux on August 30 – Sept 1. Looking east at 6 AM on Sept 1. Nearby is Epsilon Lyrae, the double-double (labeleod Epsilon2a Lyrae in the map below). This is a good test of your telescope’s resolution. A small ‘scope will resolve the star as a visual double. A good ‘scope will resolve each of those stars as a binary. Among the unique star clusters of summer is Brocchi’s cluster, or the coathanger. It’s a great binocular object. Start by focusing on Vega, then scan toward Altair. It’s about halfway between the two stars, and just a bit west. It’s also fairly unmistakable: it looks exactly like a wooden coat-hanger! August 17, 10 PM, facing south and looking overhead.